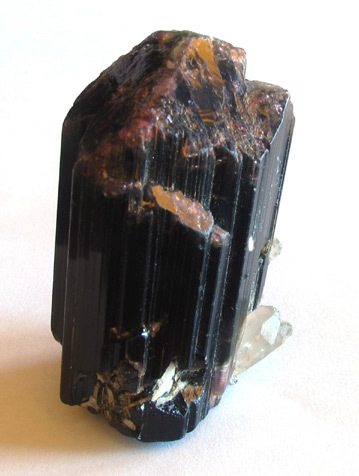 Approximately 3,900cts of Natural Obsidian from the ancient volcanoes of Oregon. You can see the sizes as we placed a dime in the photo for comparison. 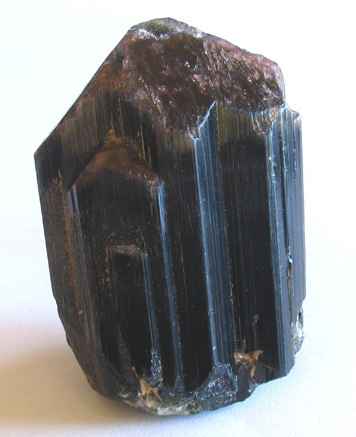 The material is dark but when held up to the light or a one slices a segment, one can see it has the color of Smoky Quartz! 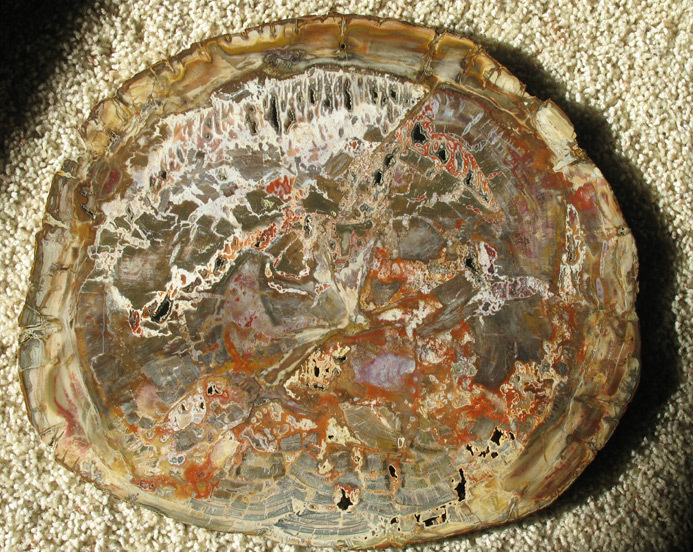 Also, there are bands, clean sections, and very interesting inclusions that were incorporated when this material was molten. 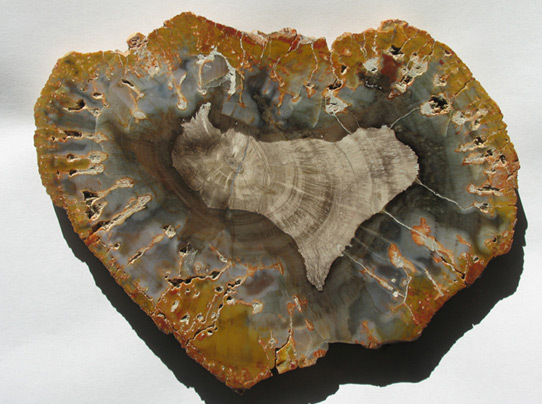 Fascinating material and can be used as part of one's rock/mineral collection, made into jewelry, sliced and polished and made into jewelry - one is only limited by one's imagination! This doubly-terminated and complete floater crystal weighs 154 gram (770 carats) Kunzite Crystal from the Oceanview Mine in California. 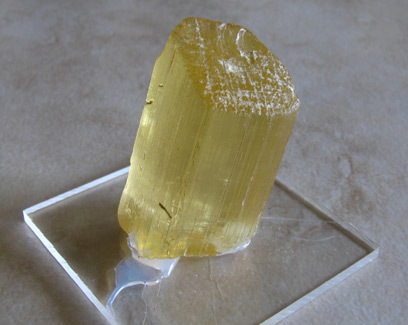 Mined in the vicinity of the Big Kahuna Pocket, late 2010 We have seen many crystals coming from this locality on the market and in museums. They have sold for what we are asking for this piece, and this beauty is head and shoulders above the others in quality, size, clarity, etc. Down one axis one sees a light green; rotating it 90degrees, one sees a medium purple; down the C axis one sees a glowing blue purple but one needs to literally use a bright flashlight to see the color - even holding it to the bright sky will not show the color. 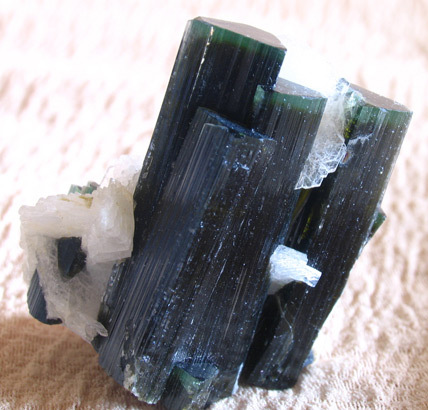 This fact of having such a deep C axis is a wonderful indication of how deeply saturated faceted gemstones would be if cut from this piece. 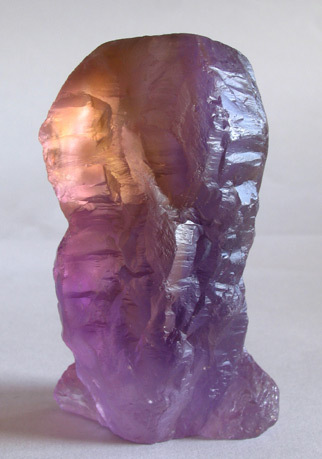 What got our attention initially, besides the great crystal structure, is that one has a natural window on one side where one can see internally into the crystal - and there is very little internally for this type of mineral, making this a great piece to actually be faceted, producing the top top top color possible in Kunzite. 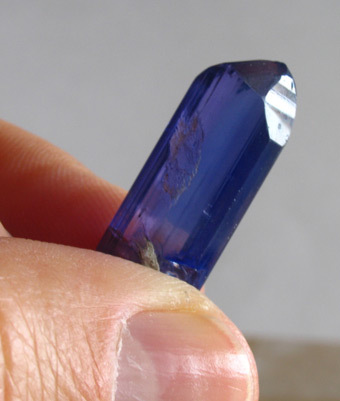 Our estimate is about 115cts or more in faceted gemstones. 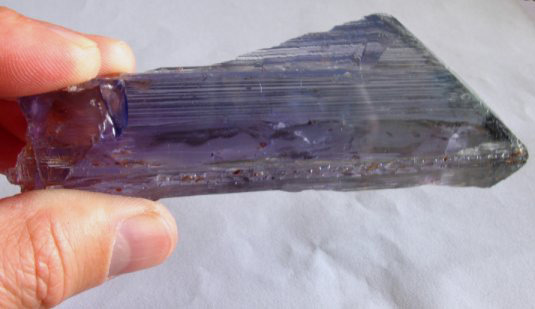 The piece measured approximately 4-1/2 inches long. 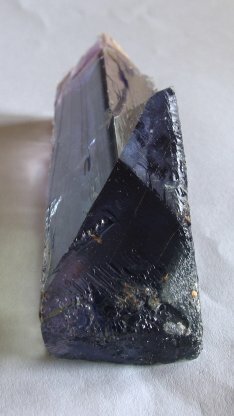 This crystal has been trimmed and gemstones are being faceted. 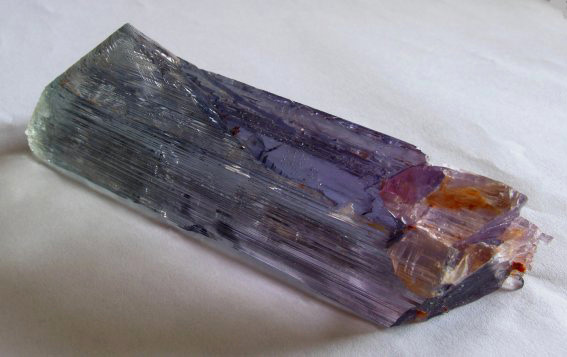 The first one has been finished and can be seen on our Kunzite Photos Page as well as on a page dedicated to the faceting of this first gemstone from this crystal. 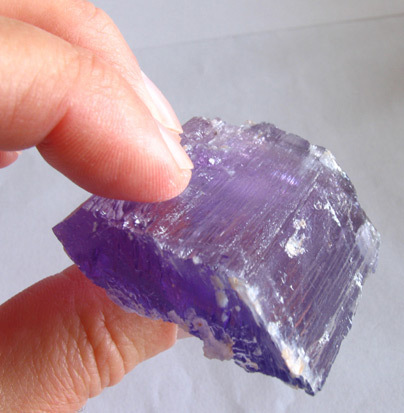 You can follow 'some' of the numerous steps and days to produce the incredibly beautiful 41+ct blue purple Modified Trilliant Kunzite! 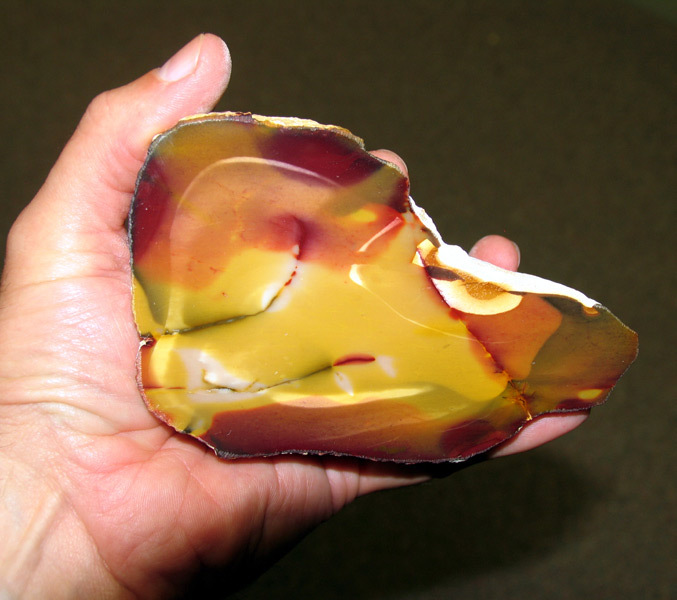 What is Mookaite? 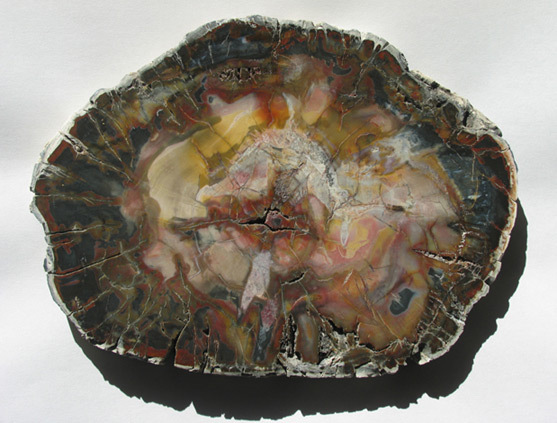 Here is one definition found on line via a Google Search: Mookaite (sometimes spelled Mookite, or just called Mook Jasper) is a colorful Jasper from Western Australia. It is a warm flood of reds, yellows and browns. 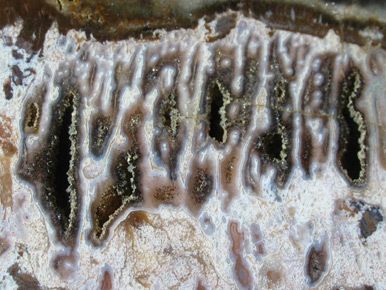 It is formed as a sediment in erosion zones and as a filler in cracks. 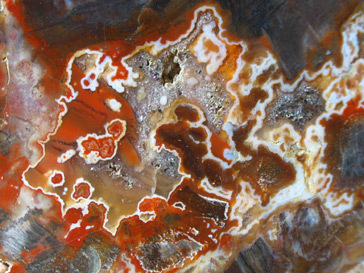 In Australia, Mookaite is considered to be a healing stone that bestows strength. It is said to shield the wearer from difficult situations and to connect us to loved ones who have passed away. 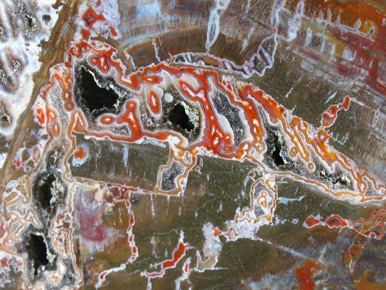 Mookaite is named for where is was first found — in outcrops, principally on Mooka Station (a sheep farm of around 700,000 acres), on the west side of the Kennedy Range in Western Australia. According to locals, the Aboriginal word “mooka” means “running waters”, no doubt in reference to the many fresh water springs that feed Mooka Creek. 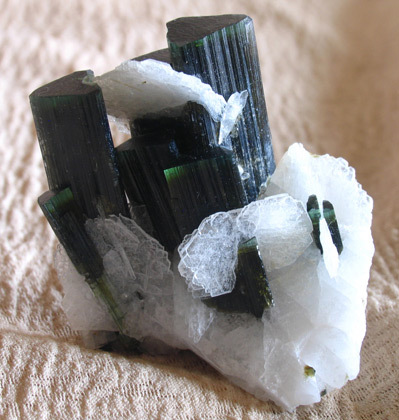 Only one mine produces this material and it is the Anahi Mine. 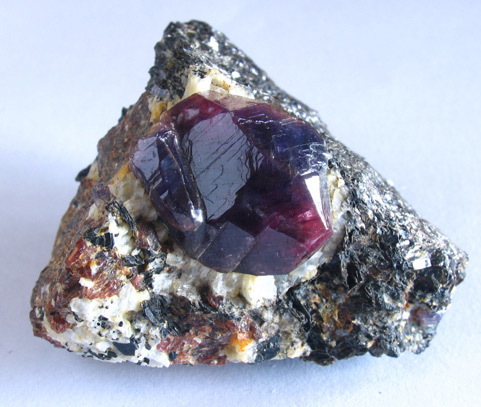 All That Glitters Gemstones and Crystal appear in a New Trade Article analyzing a Unique Ametrine showing a 'stepped zone' feature, as well as a nicely saturated 50:50 Faceted Ametrine and a crystal from the source - the Anahi Mine. 505cts measuring about 2.75" high. (jnfl-12-01a) $1,250 - Less that $2.50 per carat! 589cts measuring about 3.25" high. (jnfl-12-01b) $1,360 Has some sharp flat crystal faces on the opposite side. 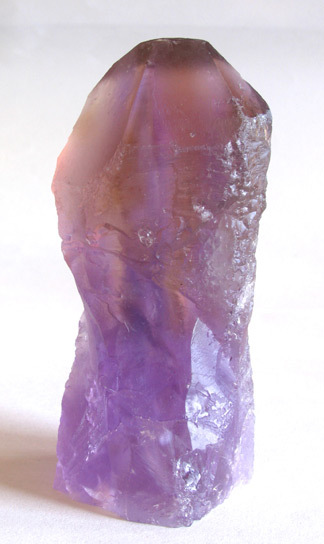 420cts - a doubly terminated floater of Kunzite from the OceanView Mine in CA. Looking down the C axis, one sees this wonderful deep bluish pink. 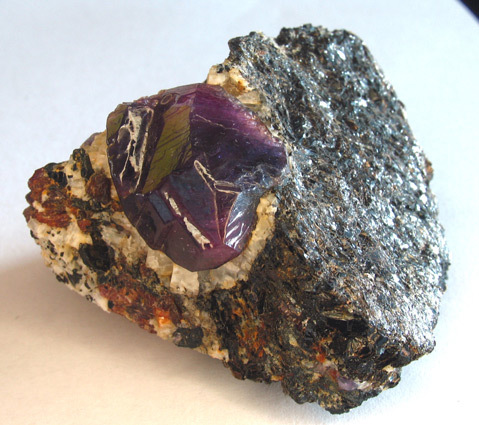 A side view is less intense in color and frequently this material has the deep bluish pink donw the C, with a light purple and light blue green down the other axis. 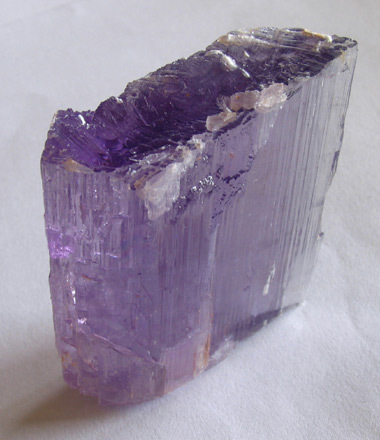 This has potential to be faceted or just kept as a fine specimen of Kunzite from this famous mine - found in the vicinity of the Big Kuhuna Strike within the past few years. (ovml-12-01) $2,700. 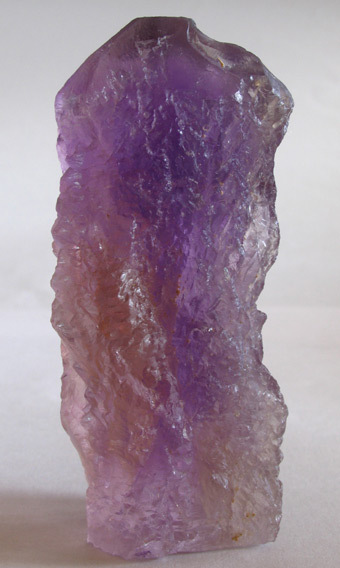 See a similar Kunzite Crystal below which looks very similar to ours, and what it sold for. 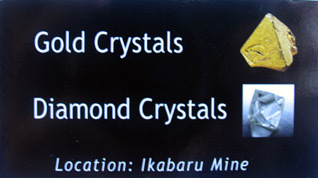 (The crystal below is larger, but our price also reflects this! The sale of the crystal was a few years ago.) 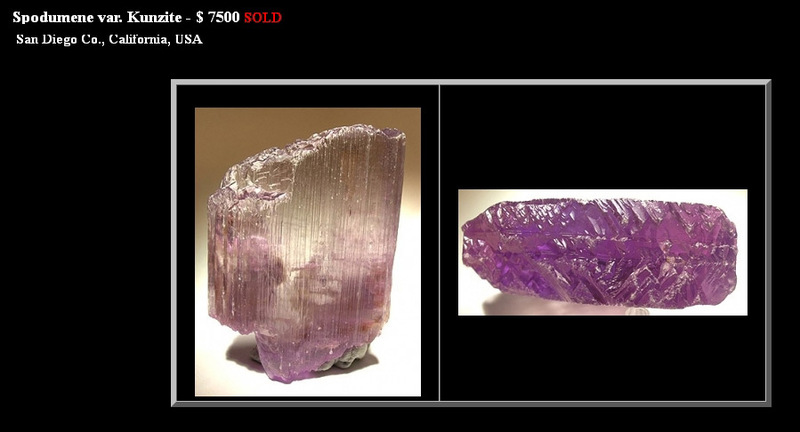 Note- prices for Kunzite Crystals and Gemstones have been increasing because this mineral is not being found and hasn't been found for quite some time. 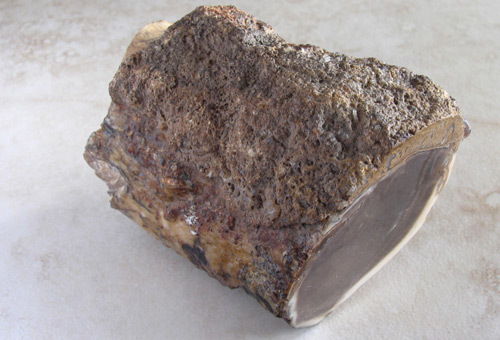 This specimen is a very fine one when compared to what is being seen out there on the market. 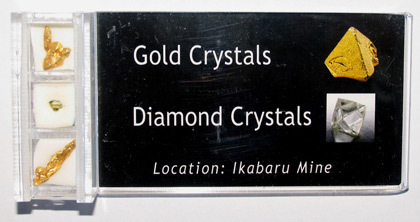 Specimen Cases with Gold and Diamonds from the Ikabaru Mine in Argentina. An example of the case is shown below - it is approximately actual size. We currently have 6 examples ranging from $125 up to $1200. 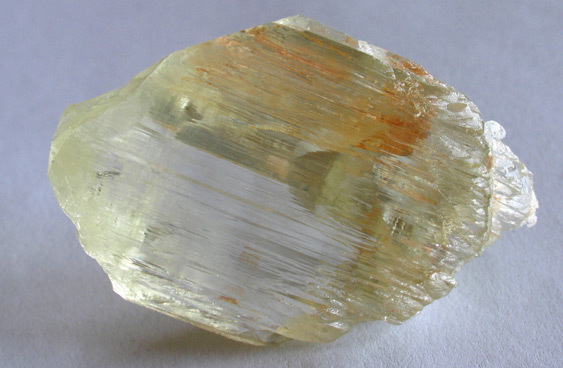 Specimens of Gold and Diamond Crystals get larger and finer as the price increases. All of the Diamonds are indeed crystals and the Gold specimens will either show crystal faces or a dendritic form of gold. These make a great addition to ones collection as well as great gifts. 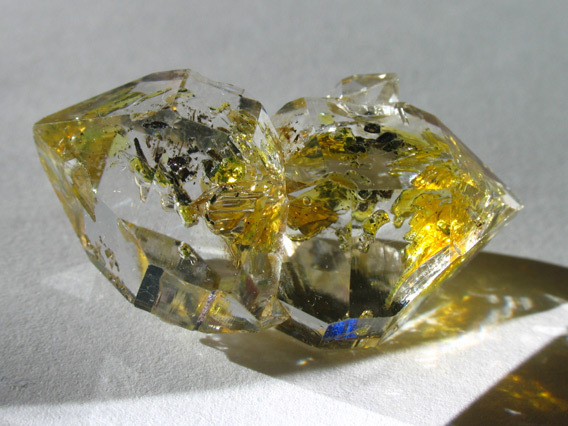 The images of the Gold and Diamonds are magnified to show the strucure/shapes. The example of a full case shown below is approximately actual size, so one can get an idea of what it will look like in person. The largest pieces of gold and diamond are the most costly. Smaller, but still fine examples of Gold and Diamond, are the less expensive - as one would expect. 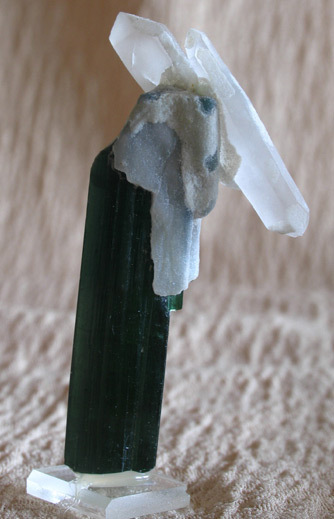 We have seen an article written on this material in Gems and Gemology Magazine (GIA) but hadn't seen this in person. One of our decades old contacts from the Afghanistan/Pakistan area had several pieces to show us. 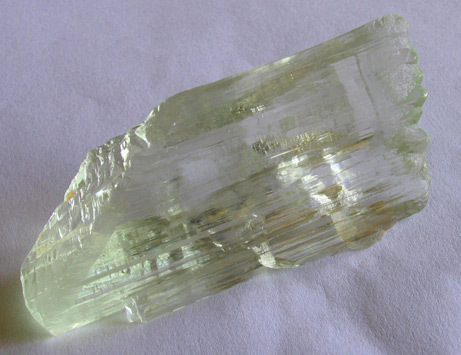 We chose the best of the small parcel, which showed two large crystals and more and were real beauties to behold. 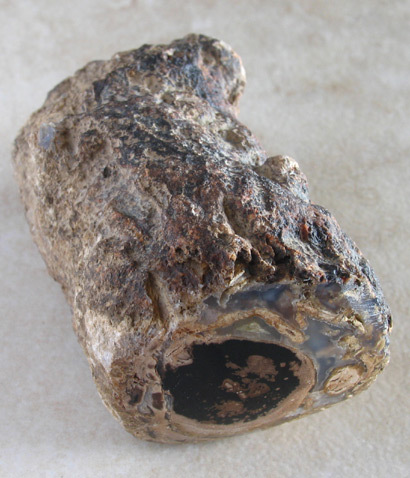 These naturally occuring crystals actually contain an oil-like substance and as one moves the crystal, one can see the oil moving as well as bubbles/gas contained within. We have also been told that these will fluoresce under ultraviolet lights! Another Rare Find that is brought to light and soon disappears due to Rarity, not to be seen again? 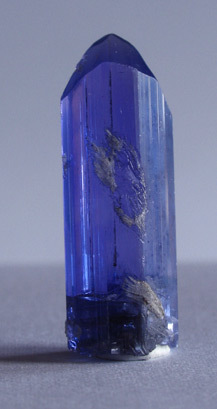 For an estimate of size, the crystals in the right hand photo measure about 1.5 inches in length. Locality is Wadh (town in the Khuzdar District of Balochistan, Pakistan). 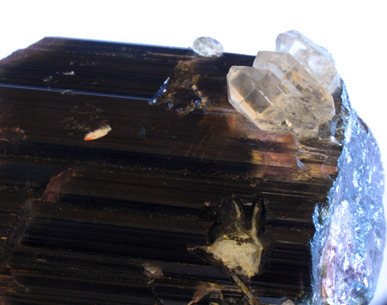 "What unusual crystals! Thanks for the safe shipping and the box. It is fun to see what things one can find when your eyes stay open. ... I am delighted that you are out there and I'll keep looking for those fun and beautiful collectibles.""